Shrimp toast, which seems rather prim and Western, is actually a very Chinese thing. 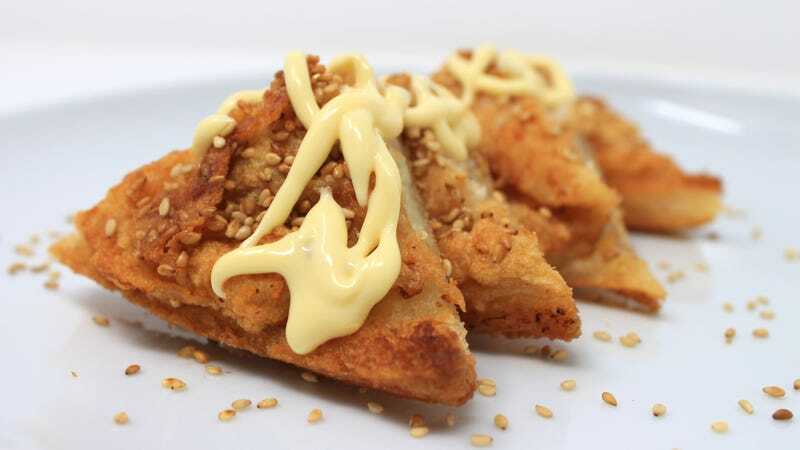 With origins as an appetizer in the northern Chinese province of Shandong, shrimp toast takes shrimp puree, slathered generously onto white bread, and deep fried whole. This dish eventually found its way a thousand miles south to Hong Kong, where it’s become a staple of dim sum. It’s fried shrimp on fried bread, impossible not to like. While my Cantonese brethren like adding a dab of Miracle Whip to the toast, I’m forever a softie for Kewpie mayonnaise. Here’s a dish that’s remarkably simple to make, and simple to make in large quantities. In a bowl, combine raw shrimp with egg white, cornstarch, sugar, minced garlic, soy sauce, fish sauce, sesame oil, and white pepper. Let sit in fridge for 30 minutes to marinate. Dump into a food processor and pulse until the shrimp mixture turns into a paste. Separately, heat a nonstick skillet to medium-high with about 1/2 inch of canola oil. Spread the shrimp paste liberally onto whole slices of white bread (make sure to remove the crusts). Sprinkle sesame seeds on top. Once the pan is at temperature, fry the bread shrimp-side down. After several minutes and just before it achieves a light golden brown, flip over and fry the bread underside. Once this side is toasty and brown, flip once more shrimp-side down and fry until golden. Cut diagonally both ways to form four triangles per slice. Generously squiggle Kewpie mayonnaise, and sprinkle with more sesame seeds. Serve immediately.